Easthorpe Lodge in North East England is a perfect choice for a great holiday or a fun short break in North Yorkshire. Find out more about Easthorpe Lodge below. A charming 19th century single storey stone cottage (no steps/stairs inside the cottage) with an enclosed garden. Newly refurbished to a high standard throughout it sleeps 4 - twin & double rooms (there is some flexibility in sleeping arrangements) - and a cot is available on request. In a secluded location set in the heart of Ryedale - the Howadian Hills is 'an area of outstanding natural beauty'. Easthorpe Lodge is 3 miles from Castle Howard. A perfect location for exploring the North York Moors, Ryedale, historic York, Whitby, Scarborough and the East Coast. Golf, fishing, horseriding and swimming pool are all nearby and the area is also an excellent base for families, walkers and cyclists. We are just 3 miles from the characterful market town of Malton & close to the delightful maket towns of Helmsley and Pickering. Many and varied attractions are within easy reach to suit all ages including: Castle Howard, Nunnington Hall (National Trust), Lavender farm Walled Gardens (Helmsley & Scampston) and Museums (including Eden Camp - an ex World War 2 camp) & Flamingoland Zoo and Themepark. Also you will find National Trust & English Heritage properties & gardens within easy reach. Short breaks offered throughout the year subject to availability. Discounts available for early bookings & booking consecutive weeks. Families & Children of all ages welcome. Easthorpe Lodge is family friendly and can accommodate twins and have a lot of child friendly equipment for babies and toddlers. This includes 2 cots, a baby monitor, 2 high chairs and 2 booster seats and a baby gym as well as a good selection of toys for inside and out. 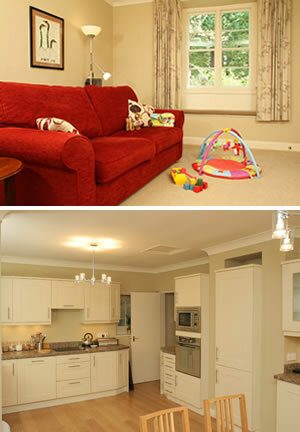 Easthorpe Lodge is family friendly self catering. For younger visitors... Oscar the Owl hangs out here! Oscar the Owl is waiting to welcome your children. Even before you arrive Oscar will have written 2 emails to introduce himself and will post each child a letter with some luggage labels. He will also send a podcast with stories about himself for the journey. He really is an extremely clever owl and is sure to keep your children company all holiday long. We have the following details listed regarding Easthorpe Lodge accommodation accessibility but we would recommend that you always confirm these prior to booking with the owner or operator. Easthorpe Lodge is a great base to explore the wonders of North Yorkshire and you will find plenty of activities near by. Easthorpe Lodge is at Malton, North Yorkshire YO17 6QX. Check out the map below for directions, use the controls to zoom in. "Thank you for a lovely stay at Easthorpe Lodge. The accommodation was first class with everything we required for a home from home stay. We hope to be back again next year. You have thought of everything." "Thanks for a lovely stay. Everything we needed for a short break away. So much better that a B&B or hotel. We'll be back again. Our daughter enjoyed the selection of toys, as we did! Plenty of info without having to leave the house." "What a lovely cottage! A real 'find' from the internet. You have thought of everything a guest will need, and the children too. Our daughter enjoyed new toys and books (yours) and playing in the sandpit (yes, in November!). So much to do in the area." "We have thoroughly enjoyed our stay at the Lodge. A beautiful place to stay. Our daughter has especially enjoyed using your library of books. The walk down the public footpath opposite had plenty of lovely muddy puddles too to splash (and sit!) in. " "Thank you so much for a lovely stay and a very warm welcome. The Peppa Pig DVD was a big hit. A very cosy and comfortable cottage in a beautiful part of Yorkshire. We had a fab family day out at Castle Howard and would have loved to stay longer." Easthorpe Lodge has a 4 star rating, do you agree? If you have stayed at Easthorpe Lodge why not add your thoughts, comments, pictures to our Facebook page? Don't forget to add the name/town/page link to your comment so its attributed to the correct place. Please keep it polite, we are sensitive souls! Find Cottage Holidays works closely with independent cottage owners and leading holiday travel operators to provide you the widest choice of self catering accommodation across England. Easthorpe Lodge in North Yorkshire is available through: Independent.